Interactive Dreams: Was CD-i designed with games in mind? An interesting view on whether CD-i was designed with games in mind by an ex CD-i developer: "I actually have a near complete set of development documents from Philips going back to 1986 when they first announced the Green Book standard and I was involved in the ICDIA as a developer from almost the beginning, although admittedly I was involved in developing training applications for public agencies in California. Within the introductory section of the specification manuals, there are numerous references to games as a potential application, along with other multimedia applications. It's like making the argument that just because early computers didn't have much besides a processor, some memory and rudimentary display hardware that they weren't intended to play games. That's silly. Games were one of the earliest applications developed for computers going back to the mainframe days. Philips planned to enter the consumer market much earlier than it did, but manufacturing costs for the CD-i made it difficult. 1988 is when very early prototype developers systems went out to literally a handful of Philips partners, but most developers didn't get anything until 1989 at the earliest with the price dropping to a more reasonable level in 1990 and 1991. Game development funded by Philips actually began as early as 1989. As a result, games were available as soon as consumer units were released in the United States in 1991/92 and continued to be available until Philips bowed out of the market. Contrary to what many people think, most of the games for the system were not FMV titles, but rather board games (Battleship, Chess, Axis & Allies, etc...), family games, some sports and racing titles, as well as some interesting hybrids. I'm not going to claim that most of the games were good, but Philips certainly invested millions of dollars in developing and marketing games and provided a lot of software considering how few units actually were sold. As early as 1989, Electronic Arts (EA) was developing games for the CD-i and considered it to be a gaming system. Just because a system can do more than one thing has nothing to do with whether or not it can be considered a gaming system. Heck, the original 3DO was used as a training system by Time Warner among other companies and had the capability to be a kiosk system as outlined in the various developer handbooks. Was the 3DO not intended to be a gaming system? Similarly, the Nuon was a DVD substandard that was always intended to be used for gaming, however, it was only built into DVD players. Is that not a gaming system? The CD-i plays games, it was always intended to do so by Philips and more than 150 of them were released. That's more than a lot of other defunct systems. Not half of them [are FMV titles] and I disagree [with every DVC required game being a FMV-game] since they might have some FMV cut screens or backgrounds, but weren't FMV movie games as the term is typically used. The Green Book is not the same as CD-i, but the CD-i systems released by Philips fully comply with the minimum Green Book standards. So, if you claim that the Green Book was not specific to gaming, you're correct, but I disagree that the CD-i was never intended for gaming." I remember Philips was used to their first generation games like Battle Ship and Connect Four when SPC Vision blew them away with the Alien Gate tech demo. That was the start of real videogaming on CD-i. I guess Philips never thought games this good were possible on CD-i! I wrote a small article about the CD-i for a book many years ago and I had a similar discussion with one of the other authors of the book. We contacted Philips and they kind of confirmed that the CD-i was indeed never designed for games. Only after the hardware design was final, they thought that games could probably written for it, calling it a potential application. But not designed with games in mind from the outset, it lacked important features such as proper sprite support or hardware scaling/scrolling, etc. Interesting trivia! I happened to get a few responses from retro games websites that were convinced in their own theory that CD-i was not intended to be a games machine. However, in the past years we at Interactive Dreams have built close contacts with a lot of ex CD-i developers who were there from the very beginning, like with Philips IMS in Eindhoven and the Natlab in Redhill, UK. Based on the very early documents CD-i was set as a multimedia standard, which included Encyclopedias, courses, music, reference titles, children titles, and, important for this view: Games. 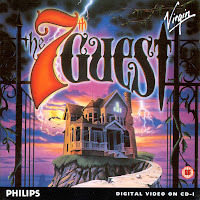 Games were part of the multimedia experience from the very beginning although Philips was very clear in telling people that CD-i was not just a videogames console. It wanted to expand on the successes its own Odyssey story and conquer against the upsomg CD-ROM format which was kind of developed around the same time. Philips believed PC's were too difficult for the consumer and thought there was a market for a multimedia machine people could hook up in their own livingroom. After 15 years, Insiders realize CD-i was a true innovative product which was the inspiration for the new generation inclusing the Wii and the Playstation 3. In the end, although games as they were developed were not in the line of expectations of Philips from the very start of CD-i, Philips positioned the CD-i being a family machine which was able to handle board games and game shows like Jeopardy and the Joker's Wild. The system itself is a Motorola 68000 based unit running at 15 MHz with 1.5 megs of RAM and 16 bit audio chip. That's very similar of the Amiga and clearly designed for games. the main thing of cd-i was that is should be the interactive version of the audio cd. that's what philips was planning from the beginning. One thing is for sure: the digital video feature was developed a lot later, so anything that CD-i games made special thanks to the digital video wasn't planned from the beginning!